This paper analyzed the foreign direct investment and the Nigerian Economy over the period of 1986- 2017. The main type of data used in this study is secondary data; sourced from various publications of Central Bank of Nigeria, such as; Statistical Bulletin, Annual Reports and Statement of Accounts. The regression analysis of the ordinary least square (OLS) is the estimation technique that is being employed in this study to determine the relationship between and impact of the Direct Foreign Investment on economic growth. The findings revealed that economic growth is directly related to inflow of foreign direct investment and it is also statistical significant at 5% level which implies that a good performance of the economy is a positive signal for inflow of foreign direct investment. This implies that foreign direct investment is an engine of economic growth. The paper recommended that government should liberalize the foreign sector in Nigeria so that all barriers to trade such as arbitrary tariffs; import and export duties and other levies should be reduced so as to encourage investors. Economic theories have shown that Foreign Direct Investment (FDI) being one of the key macro-economic variables has a positive relationship with economic growth. Therefore, this study specifically test the hypothesis on whether or not FDI has positive and significant impact on output growth on the Nigerian Economy. The study analyzed the impact of foreign direct investment on Nigeria’s economic growth over the period of 1986- 2017. I chose to collect my data for analysis from 1986 because this was the year of Nigerian Structural Adjustment Program. Under World Bank structural adjustment, the government tried to eliminate inefficient state intervention and obtain budgetary relief by abolishing agricultural commodity marketing boards and liberalizing cash-crop exports. 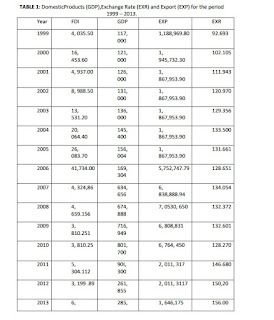 These measures, together with devaluation, increased the naira prices of export crops, especially cocoa. The state also privatized many public enterprises by selling equity to private investors, while restructuring other parastatals to improve efficiency. The federal government encouraged private investment in the late 1980s, allowed foreign ownership in most manufacturing, and liberalized and accelerated administrative procedures for new investment. In August 1985 the government at a time of depressed oil prices, undertook its structural adjustment program between 1986 and 1988. In September 1986, the government introduced a second-tier foreign exchange market (SFEM), sold on auction for a near equilibrium price and used for export earnings and import trade requirements. Under SFEM, the naira depreciated 66 percent to N1=US$0.64 (N1.56=US$1), and declined further in value through July 1987, when the first and second tiers were merged. When adopting the SFEM, Nigeria abolished the ex-factory price controls set by the Prices, Productivity, and Incomes Board, as well as the 30 percent import surcharge and import licensing system. It reduced its import prohibition list substantially and promoted exports through fiscal and credit incentives and by allowing those selling abroad to retain foreign currency. Although this action opened the way for an IMF agreement and debt rescheduling, the military government declined to use an allocation of Special Drawing Rights in IMF standby funds . Meanwhile, the naira continued depreciating, especially after the relaxation of fiscal policy early in 1988. The effect of the SFEM in breaking bottlenecks, together with the slowing of food price increases, dampened inflation in 1986, but the easing of domestic restrictions in 1988 reignited it. Real interest rates were negative, and capital flight and speculative imports resumed. In 1989 the government again unified foreign exchange markets, depreciating--but not stabilizing--the naira and reducing the external deficit. Manufacturing firms increased their reliance on local inputs and raw materials, firms depending on domestic resources grew rapidly, and capacity utilization rose, although it was still below 50 percent. Concurrently, nonoil exports grew from US$200 million in 1986 to US$1,000 million in 1988. This amount, however, represented only 13 percent of export value at the level of the 1970s, and cash crops like cocoa dominated the export market. Large firms benefited from the foreign exchange auction and enjoyed higher capacity use than smaller ones. Despite dramatically reduced labor costs, domestic industrial firms undertook little investment or technological improvements (Jelilov, Gylych; Kalyoncu, Huseyin; Isik, Abdurahman, 2015). Structural adjustment was accompanied by falling real wages, the redistribution of income from urban to rural areas, and reduced health, education, and social spending. The decrease in spending on social programs contributed to often vociferous domestic unrest, such as Muslim-Christian riots in Kaduna State in March 1987, urban rioting in April 1988 in response to reduced gasoline subsidies, student-led violence in opposition to government economic policies in May and June 1989, and the second coup attempt against General Babangida in April 1990. The time I have at my disposal is limited. As a result I will not be able to carry out an extensive research. There are several variables of economic development I could have chosen for my research. However due to my time limit I was not able to carry out such an extensive research which could have given me a different answer .As a final point I will like to mention that the sources of information available to me come mostly from the internet. The literature and data gathered for this research gotten from the online journals, books, and previously done researches. To get my quantitative data I also used the website of National Bereau of Statistics. Economic theories have shown that Foreign Direct Investment (FDI) being Nigeria receives the largest amount of FDI in Africa. FDI inflows have been growing enormously over the last decade; from $1.14billion in 2001 and $2.10billion in 2004. Nigeria’s FDI reached $11billion in 2009 according to United Nations Conference on Trade and Development (UNCTAD, 1999), making the country the nineteenth greatestrecipient of FDI in the world. It is widely accepted that FDI is necessary for the growth and development of the economy, especially in the developing countries. And Nigeria has the potential to attract sufficient FDI but has not been successful in attracting it to a large extent despite her efforts of liberalizing its foreign direct investment regime and intensifying its enabling environment. Given the low level of saving in Nigeria, it therefore becomes necessary that the appropriate policy to pursue is to increase FDI to supplement the low level of domestic saving for economic growth. And in reference to these problems, Ajayi (2003) said that of all the capital inflow into the Nigerian economy from other countries, increase in FDI is the most promising policy due to its potential in dealing with the problems of savings gap, shortage of technology and needed skills. The level of economic growth achieved over the years has been largely constrained by lack of adequate capital to finance government projects. And despite the huge resource base of the country, Nigeria has not been able to attract a high level of foreign investors that is commensurate with its economic potentials. Nevertheless, it can also happen that FDI may harm the host economy (Herzer et al. (2006)), for instance when foreign investors claim scarce resources or reduce investment opportunities for local investors. Sabina Noormamode ( 2008), acknowledged that there is also some concern that no positive knowledge spillovers may finally occur within developing countries, because multinationals will prove able to protect their from-specific knowledge, or because they may buy their inputs from foreign rather than local suppliers.on the benefits of FDI on growth, although it is fair to say that the evidence gathered so far remains relatively ambiguous. While some authors found no significant relation between FDI and growth, other ones showed either an unconditional positive link between these two variables or a relationship that is conditional to particular characteristics of the host country, such as the level of human capital or the depth of the financial system. At least two reasons explain these mixed results. First, most of the authors analyzed the correlation between FDI and growth using a regression analysis framework that is silent on the causality between these two variables. Second, in the studies that do address the causality issue, the influence of other social and economic variables are seldom taken into account directly within the model and, in many cases,these are simply ignored. The effects of Foreign Direct Investment (FDI) focused on the direct impacts of the multinationals such as additional capital brought into the country, the creation of jobs, the effects on the balance of payment, and so on (MacDougall, 1960). However, since then, the research on FDI effects has increasingly acknowledged that technological, organizational and managerial spillovers on the local firms probably represents the most influential role of MNCs in host country development. Blomstrom and Kokko (1997) acknowledged that spillovers from FDI are essentially positive externalities from the presence of MNCs on the local economy of the host country. Dunning (1988) argued that since a MNC often is profoundly different from a non-MNC (local firm) in terms of technology, capital, organizational and managerial capabilities, and international market access, there is a potential for significant spillovers on the local economy and local firms. FDI has been instrumental in the development of several developing countries such as Nigeria because the inflow of FDI brought about a better economic performance for the country. And policies designed on the accumulation of human capital surely have a much larger potential for attracting FDI needed for development (Lucas, 1990). Using an endogenized technical progress model, Grossman and Helpman (1990) conclude that countries that have adopted an outward-oriented development strategy have grown faster and achieved higher levels of standard of living than their counterparts who engaged in protectionist exports’ policies. Fry (1992) examined the role of FDI in promoting growth by using the framework of a macro-model for a panel data of 16 developing countries for the period 1966 to 1988. Adelegan (2000) used unrelated regression model to examine the impact of FDI on economic growth in Nigeria, and found that FDI is pro-consumption and pro-import and negatively related to Gross Domestic Product (GDP). Also, some studies have emphasized the importance of attracting FDI to developing countries as well as economic openness as policies that developing countries should pursue (Asiedu 2003; and Akinkugbe 2003. Blomstrom et al. (1994) shows that FDI exerts a positive effect on economic growth, but there is a threshold level of income above which FDI has positive effect on economic growth and below which it does not. And the explanation is simply that it is only those countries that have reached a certain income level that can absorb new technologies and benefit from the technological diffusion, and then reap the extra advantage that FDI can offer. De Mello (1997) shows a positive correlation between FDI and economic growth for selected Latin American countries. FDI has empirically been found to stimulate economic growth by a number of researchers (Borensztein et al, 1998; Glass and Saggi, 1999). Laura Alfaro (2003) finds that total FDI exerts an ambiguous effect on growth. However; her study finds out that FDI in primary sector has a negative effect on growth while FDI in manufacturing sector had a positive effect on growth but an ambiguous effect in the service sector. Many authors have argued that direct interaction – typically labeled linkages will facilitate spillovers (Altenburg, 2000; Scott-Kennel and Enderwick, 2005; Hansen et al., 2006). Wilkins (1998) stated that MNC appeared to foster broad linkages in the host economy by creating industries that supply the MNC and by inducing forward industries to use the MNC output as inputs, the so-called crowding-in effect of FDI. Also, Odozi (1995) and Obadan (1982) argued that FDI is beneficial to recipient nations because it allows for the inflow of foreign exchange and new technologies, and it generate employment and enhance the income of the recipient countries through taxation and payment of royalties. Some studies have found a positive relationship between foreign direct investments and economic growth in Nigeria. Obinna (1983), Ayanwale and Bamire (2001), Aseidu (2003), Akinlo (2004), and Bakare (2010) found that there is a positive relationship between foreign direct investment and economic growth in Nigeria. Previous studies on the Foreign Direct Investment (FDI) and economic growth in Nigeria and other countries provided inconclusive evidence. Lall (2002) opined that FDI inflow affects many factors in the economy and these factors in turn affect economic growth. This review shows that the debate on the impact of FDI on economic growth is far from being conclusive. The role of FDI seems to be country specific and can be positive, negative or insignificant, depending on the economic, institutional and technological conditions in the recipient countries. For instance, Solomon and Eka (2013) investigated the empirical relationship between Foreign Direct Investment and economic growth in Nigeria. Alejandro (2010) explained that FDI plays an extra ordinary and growing role in global business and economics. It can provide a firm with new markets and marketing channels, cheaper production facilities access to new technology products, skills and financing for a host country or the foreign firms which investment, it can provide a source of new technologies, capital processes products, organization technologies and management skills and other positive externalities and spillover that can provide a strong impetus to regional economic growth. Obwona (2001) noted in his study of the determinants of FDI and their impact on growth in Uganda that macroeconomic and political stability and policy consistency are important parameters determining the inflow of Foreign Direct Investment (FDI) into Uganda and that Foreign Direct Investment (FDI) affects growth positively but insignificant. Foreign Direct Investment (FDI) also contributes to economic growth via technology transfer. Zhang (2001) argued that Foreign Direct Investment has positive growth impact that is similar todomestic investment along with partly alleviating balance of payment deficit in the currentaccount. He opined that via technology transfer and spillover efficiency, the inflow of directforeign investment might be able to stimulate a country economic performance. Ewe-Ghee Lim (2001) summarized recent arguments and findings on FDI and its correlation with economic growth focusing on literature regarding spillovers from FDI and found that while substantial support exists for positive spillovers from FDI, there is no consensus on casualty.Otepola (2002) also examined the importance of direct foreign investment in Nigeria. The study empirically examined the impact of FDI on growth. He concluded that FDI contributessignificantly to growth especially through exports. Ricardo, Hwang and Rodrick (2005) argued that Foreign Direct Investment (FDI) provide a path for emerging nations to export the products developed economies usually sell, in effect increasing their export sophistication. Many developing countries pursue FDI as a tool for export promotion, rather than production for the domestic economy. Typically foreign investors build plants in nations where they can produce goods for export at lower costs. Bende-Nabende (2002) also found that direct long term impact of Foreign Direct Investment (FDI) on output is significant and positive for comparatively economically lessadvanced Philippines and Thailand, but negative in the more economically advanced Japan andTaiwan. In the same line, Ariyo (1998) studied the investment trend and its impact on Nigeria’s economic growth over the years. He found that only private domestic investment consistently contributed to raising GDP growth rates during the period considered (1970–1995). However, Alfaro et al, (2003) affirmed that the contribution of FDI to growth depends on the sector of the economy where the FDI operates. He claimed that FDI inflow to the primary sectors, tends to have a negative effect on growth, however, as for the service sector, the effect of DFI inflow is not so clear. Durharm (2004) for example, failed to establish a positive relationship between Foreign Direct Investment (FDI) and growth but instead suggests that the effects of Foreign Direct Investment (FDI) are contingents on the absorptive capability of host countries. Nwankwo et al, (2013) investigated the impact of globalization on foreign direct investment in Nigeria-since the world has become a global village. The methodology used is purely descriptive and narrative and the data used is secondary. It was found out that foreign direct investment (FDI) has been of increased benefit to Nigeria in the area of employment, transfer of technology, encouragement of local enterprises etc. But there are certain impediments to the full realization of the benefits of foreign direct investment. Adelegan (2000) also explored the seemingly unrelated regression model to examine the impact of FDI on economic growth in Nigeria and found out that FDI is pro-consumption and pro-import and negatively related to gross domestic investment. In the same line, Ogiogio (1995) reported negative contributions of public investment to GDP growth in Nigeria for reasons of distortions. Oyinlola (1995) also conceptualized foreign capital to include foreign loans, direct foreign investments and export earnings. Using Chenery and Stout’s two-gap model (Cheneryand Stout, 1966), he concluded that FDI has a negative effect on economic development in Nigeria. The impacts of FDI and economic growth disparity among developing countries have created much research interest among economists. There is a large body of empirical literature on the impact of FDI oneconomic growth. The existing evidence, however, is mixed. In the work of Li and Liu (2005), the evidence suggests that FDI not only affects growth directly, but also indirectly through its interaction with human capital. Further, they find a negative coefficient for FDI when it is regressed with the technology gap between the source and host economy using a large sample, Borensztein et al. (1998) found similar results i.e. that inward FDI has positive effects on growth with the strongest impact, coming through the interaction between FDI and human capital. He further argue that FDI is an important vehicle for the transfer of technology, which contributes relatively more to growth than domestic investment. He added that FDI has the effect of increasing domestic investment. De Mello (1997) found positive effects of FDI on economic growth in both developing and developed countries, but concludes that the long-run growth in host countries is determined by the spillovers of knowledge and technology from investing countries to host countries. Similarly, Balasubramanyam et al. (1996) found support for their hypotheses that the growth effect of FDI is positive for export promoting countries and potentially negative for import-substituting ones. Comparing evidence from developed and developing countries, Blonigen and Wang (2005) noted that the factors that affect FDI flows are different across the income groups. Interestingly, they find evidence of beneficial FDI only for developing countries and not for the developed ones, while they find the crowding-out effect of FDI on domestic investment to hold for the wealthy group of nations. In addition, Vu and Noy (2009) study on sectoral analysis of foreign direct investment and growth in developed countries with a particular emphasis on the sector impacts of FDI on growth reveal that, FDI has no statistical and positive effects on economic growth through its interaction with labour. Adelegan (2000) etc. Aluko (1961), Brown (1962) and Obinna (1983) findings suggest a positive relationship between FDI and economic growth in Nigeria while Okon et.al, (2012) examine if there is any sort of feed-back relationship between FDI and economic growth in Nigeria using single and simultaneous equation systems. The results obtained show that FDI and economic growth are jointly determined in Nigeria and there is positive feedback from FDI to growth and from growth to FDI. Adelegan (2000) examine the impact of FDI on economic growth with Seemingly Unrelated Regression model. (2001) assessed the influence of FDI on firm level productivity in Nigeria and reported positive spillover of foreign firms on domestic firm productivity. Accordingly, studies such as Ayanwale (2007) and Akinlo (2004) focused on the oil and non-oil sector. These studies assessed the impacts of FDI inflows to the extractive industry on Nigeria‟s economic growth. Akinlo (2004) specifically controlled for the non-oil FDI dichotomy in Nigeria. Using error correction model, he investigated the impact of foreign direct investment (FDI) on economic growth in Nigeria. He found that both private capital and lagged foreign capital have small and not a statistically significant effect on economic growth. Further, his results support the argument that extractive FDI might not be growth enhancing as much as manufacturing FDI. Egwaikhide (2012) also investigates the relationship between foreign direct investment (FDI) and economic growth in Nigeria, Johansen Cointegration technique and Vector Error Correction Method in which FDI is disaggregated into various components. The Johansen Cointegration result establishes that the impact of the disaggregated FDI on real growth in Nigeria namely: agriculture, mining, manufacturing and petroleum sectors is very little with the exception of the telecom sector which has a good and promising future, especially in the long run. Furthermore, past level of FDI and level of infrastructures are FDI enhancing. Ayadi (2009) investigates the relationship between FDI and economic growth in Nigeria and discovered weak correlation and causality between the variables and recommends that infrastructural development, human capital building and strategic policies towards attracting FDI should be intensified. In the same vein, Osinubi and Amaghionyediwe (2010) examined the relationship between foreign private investment (FPI) and economic growth in Nigeria. Their findings suggest that FPI, domestic investment growth, net export growth and the lagged error term were statistically significant in explaining variations in Nigeria economic growth while Ayashagba and Abachi (2002) evidenced a significant impact on economic growth. The relevance of foreign direct investment cannot be overemphasized. Its significant influence on the provision of new technologies, products, management skills and competitive business environment, overtime has been a strong impetus for economic growth. Many countries of the world, especially emerging economies faviour policies that encourages the inflow of foreign direct investment because of it positive spillover associated with the provision of funds and expertise that could help smaller companies to expand and increase international sales and transfer of technology thus, forming new varieties of capital input (i.e. flow of services available for production from the stock of capital goods e.g. equipment, structures, inventories etc) that cannot be achieved through financial investments or trade in goods and services alone. Nigeria is one of the economies with great demand for goods and services and has attracted many FDI over the years since the discovery of crude oil. According to the World Bank, from 1970 to 1979, Nigeria recorded an average ratio of foreign direct investment net inflow of about 1.579 to GDP while from 1980 to 1989, the average ratio of FDI net inflow to GDP recorded stood at 1.947. Thus, in 1994 and 1993, the countrymade a remarkable record of 8.28 and 6.3 respectively. Since 1993 and 1994, the record was not an issue to contend with. 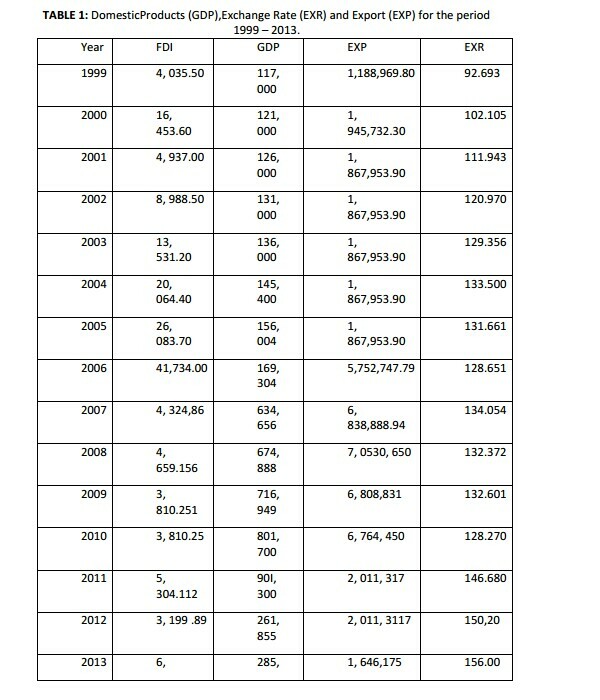 To the greatest dismay, from 1995 to 2010, FDI, net inflow as % of GDP in Nigeria has not gone beyond 4.0 except in 1996, 1997, 2005 and 2009 the country made a record of 4.51, 4.25, 4.44 and 5.08 respectively. World Bank research contained in global development finance 2008 shows that Thailand attracted $9.6 billion in 2007 while Nigeria attracted just about $6.03 billion. Also, CBN (2010) annual report also indicated that total foreign direct investment inflow into the Nigerian in 2010 was about $5.99 billion. The breakdown of the amount according to the report shows that FDI portion was just 12.2 percent or $668 million. This represents a 78.1 percent drop from $3.31 billion in 2009. In light of the above, many Nigerians are lost in guesses of the likely causes of the insignificant inflow of FDI into the country. This has been a source of worry to both policy makers and government authorities. Amidst, Asiedu, (2005) asserted that the level of FDI attracted by Nigeria is mediocre compared with the resource based and potential need, taken into cognizance of the fact that Nigeria is the 8th ranked most populous nation and 32nd biggest economy in the world (CIA World fact book) with the endowment to do better than its counterpart South Africa as the Africa biggest economy following the statement of investment giant Morgan Stanley. In view of CBN (2010) report, poor state of infrastructural facilities, high level of corruption, poor business environment/insecurity, weak institutional/legal framework, and poor property right protection has been linked to the significant drop in FDI inflow into the country in recent years. This has influenced negatively, the impact on the desires of foreign investors for Nigeria‟s Paper assets, thus resulting to a sharp fall in portfolio investments by 87.1 percent to 65.5 percent ($3.9 billion) capital inflows into the country in 2010. In support of this report, Zhang, (2001) asserts that the extent to which FDI contributes to growth depends on the economic and social condition or the quality of the environment of the recipient country. Hence, World Bank/IFC (2012) latest ease of doing business equally shows that Nigeria was ranked 133rd out of 183 countries and 4th (i.e. partly free) in the freedom of world country rating report associated with her political right and civil libertieswhile, the global anti-corruption body (Transparency International) yearly ranking of public sector transparency moved Nigeria up from 143rd in 2011 to 139 in 2012. Even though the Federal Government dismissed the rating by Transparency International (TI), saying it was a product of “synopsis of negative media reports (Emmanuel and Agande, 2012), the fact remains that a value system that aim at ordering and prioritizing the ethics and ideology is seriously need to shape the perceptions and thinking of foreign investors about the country and to step up the inflow of FDI into the country. In recent time, federal government of Nigeria has grown much concern over the threat and challenges facing the country. To this, many policy reforms has been initiated in order to change the belief and the value system of people on the basis of Nigerian‟s social, economy and the political philosophy. For example in 2007, former president of Nigeria, Alhaji Umaru Musa Yar‟Adua (Late) initiated a policy reform called “Seven (7) point agenda” to address the problem of dilapidated infrastructural facilities and insecurity of lives and property. However, in 2011, President Goodluck Ebele Jonathan initiated a complementary policy tagged the transformation agenda. The agenda focused on non-inflationary growth, employment generation, poverty alleviation and value reorientation of the citizenry thereby challenging different arms and institutions of the government such as the national assembly, judiciary, electoral umpire and armed forces to stand on their feet to re-invent the wheel to property and human right protection and conducive business environment in order to exploit the inherent benefits of the agenda to promote economic growth of the country. Furthermore, the empirical linkage between FDI and economic growth in Nigeria is yet unclear, despite numerous studies that have examined the influence of FDI on Nigeria‟s economic growth with varying outcomes (Adelegan, 2000 and Akinola, 2004). Thus, the relationship between FDI and growth may be country and period specific (Egbo, Nil). Asiedu (2003) submits that the determinants of FDI in one region may not be the same for other regions. Also, the determinants of FDI in countries within a region may be different from one another and from one period to another. In the previous literature, many studies made conscious effort in revealing the causality effect and the impacts of FDI on economic growth in Nigeria with very few examining the influence of FDI into specific sectors like agricultural, manufacturing and telecommunication sector. Previous studies look at FDI in a broad term without looking at the specific sectors and it impact on the economy as at the time of this study. The work of Ayanwale (2007) and Egwaikhide (2012) investigated the impact of FDI taken into consideration of specific sectors of both non-oil and oil sector respectively. Hence, Ayanwale (2007) investigate the empirical relationship between non-extractive FDI and economic growth while Egwaikhide (2012) examine the long run relation between FDI in five sectors of the economy for periods of 1980 to 2009using Johanson cointegration test and annual data. Thus, our study intends to investigate the impacts of FDI in three sectors of the economy such as Agricultural, manufacturing and Telecommunication sector on economic growth in Nigeria, hence shading more light on the importance of development of these sectors order than the oil sector. Following the World Bank/IFC (2012) latest ease of doing business and Global Anti-corruption (Transparency International) report of 2011 and 2012 in Nigeria that shows unfavorable business environment and weak property right protection, we intend to investigate the impacts of business environment divided into political, institutional/legal framework and macroeconomic factors on FDI inflow into Nigeria for the periods of 1980 to 2009, using quarterly data. Furthermore, we further extended our investigation to the direction of causality between FDI in the three sectors and economic growth. With the inclusion of business environment, legal/institutional framework, causality test and the use of quarterly data, the study departs from the work of Ayanwale (2007) and Egwaikhide (2012). Foreign Direct Investment (FDI) is an investment made to acquire a lasting management interest in a business enterprise operating in a country other than that of the investor (World Bank, 1996). According to Thirwall (1994), FDI refers to investment by multinational corporations (MNCs) with headquarters in developed countries. This investment involves not only a transfer of funds but also a whole package of physical, techniques of production, managerial and marketing expertise, products, advertising and business practices for the maximization of global profits. FDI comprises not only merger and acquisition and new investment, but also reinvested earnings and loans and similar capital transfer between parent companies and their affiliates. The regression analysis of the ordinary least square (OLS) is the estimation technique thatis being employed in this study to determine the relationship between and impact of theDirect Foreign Investment on economic growth proxy by Gross Domestic Product (GDP). GDP = f ( DFI, EXP, EXR). The result in appendix 1 shows that the predictor variables (i.e Direct foreign investment, export earnings and exchange rate) were significantly joint predictors of Gross Domestic Product ( F( 3, 10) = 5.964; R2= 0.641) at 5%level. The predictor variables jointly explained 64.7%of GDP, while the remaining 35.3% could be due to the effect of extraneous variables. Furthermore in appendix 2, it can be deduced from the result obtained that the constant parameter in the long – run is positive. This implies that if all the explanatory variables are held constant, GDP will increase by 0.50 units. This result is agreed with Oyatoye et al (2011); Alejandro (2010); Lall (2002); Otepola, (2002) and Ariyo, (1998) that Direct Foreign Investment is inevitable in economic growth of a nation.The coefficient of Foreign Direct Investment is 0. 364, it has a positive relationship with GDP (t = 1.889, P<.05) showing that a unit increase in real foreign direct investment (FDI) will increase GDP by 0. 364. The coefficient of Export Earningsis 0.850, it has a position relationship with GDP (t = 2.890, P<.01) showing that a unit increase in export earnings (EXPT) will increase GDP by 0.850. Also, the coefficient of exchange rate is 0.275, it has a positive relationship with GDP (t = 2.890, Pns) showing that a unit increase in real exchange rate (EXR) will increase GDP by 0.275. The findings revealed that economic growth is directly related to inflow of foreign direct investment and statistically significant at 5% level. This implies that a good performance of the economy is a positive signal for inflow of foreign direct investment. It can be concluded that foreign direct investment is an engine of economic growth. Therefore, there is need to have a stable political and economic environment and improve on the critical infrastructure, level of security at all levels in the country, systems of governance should be is based on accountability, transparency, effective and efficient resource. Furthermore, government needs to liberalize the foreign sector in Nigeria so that all barriers to trade such as arbitrary tariffs; import and export duties and other levies should be reduced so as to encourage investors.The findings suggest that Nigeria have not done a good job in increasing the skill level in their workforce to benefit the economy on the FDI inflows. The study also finds out that within the study period, FDI was complementary to foreign AID. Perhaps, Nigeria valued foreign Aid more than FDI. Hence, the slow shift in policies that attract FDI in Nigeria. It is important that the focus should be directed towards policies that will attract FDI. FDI has more potential for expanding the economy base than foreign AID. It is obvious that the multiplier effect that comes from FDI in terms of private sector development of the economy is also lost to the public sector, hence the low level of economic activity or market-based expansion in Nigeria. 1. Appropriate economic policy of market liberalization and macroeconomic stability should be put in order for attracting FDI into Nigeria. Furthermore, policies are needed to address the level of skills embodied in labor. 3. Policies that will bring about improvement in foreign direct investment and balance of payments (BOP) in the economy should be encouraged. 4. A good macroeconomic policy to improve the institutional frameworks, including stable and high economic growth rate, liberal exchange rates, convertible currency, low inflation, minimal current account deficit and external indebtedness, low interest rates and access to capital, efficient banking system and capital markets, and competitive corporate tax rates should be prioritized. Sabina Noormamode (2008),Impact of Foreign Direct Investment on Economic Growth: Do Host Country Social and Economic Conditions Matter? Bemde-Nabende, A., J. Ford, S. Sen and Slater J (2002). “Foreign Direct Investment in East Asia: Trends and Determinants”. Asia Pacific Journal of Economics and Business 6(1): 4-25. CBN (2013): Statistical Bulletin. Central Bank of Nigeria. Chenery, H. B. and Stout, A. (1966): “Foreign Assistance and Economic Development”. equity foreign portfolio investment on economic growth; European Economic Review, 48(2): 285 – 306. Lall (2002): Foreign investment transactional and development countries, Macmillan Press Ltd, London. Macaulay, E.D (2012). Foreign direct investment and the performanceOf the Nigerianeconomy.Proceedings of the 1st International Technology, Education and Environment Conference.Pp 629 -633. Investment In Nigeria. Lorem Journal of Business and Economics (LJBE) Volume 1 No 1 pp 11-17. Uganda” . African Development Review 2001, Blackwell Publishers Oxford.Uk.46-80. Nigeria”.In A. Ariyo, ed., Economic Reform Macroeconomic Management in Nigeria. Ibadan: The Centre for Public Private Cooperation. Onu, A.J.C (2012). Impact Of Foreign Direct Investment On Economic Growth In Nigeria. Interdisciplinary Journal Of Contemporary Research In Business. 4(5), 64-75. Otepola, A. (2002): “FDI as a Factor of Economic Growth in Nigeria. Dakar, Senega”. African Institute for Economic Development and Planning (IDEP), May. Available online at:idep@unidep.org, http://www.unidep.org. Oyinlola, O. (1995).“External capital and economic development in Nigeria (1970-1991)”. The Nigerian Journal of Economic and Social Studies, 37 (2&3): 205-22. Ricardo, H , Hwang, J and Rodrik, D (2005). What you export matters. “Working papers” Center For International Development at Harvard University. Solomon, H.C and Eka, O.O (2013).Impact of foreign direct investment on telecommunication sector on nigerian economy. International Journal of Modern Social Sciences. 2(3): 195-215. Todaro, M.P. (1994). Economic development (5th Edition). New York and London: Longman. World Bank.(1996). World Debt Tables: Exterrnal Finance for Developing Countries. Vol.1 (Analysis and Summary Tables). Washington, D. C.
Adelegan, J. O. 2000, Foreign Direct Investment and Economic Growth in Nigeria: A seeminglyunrelated model”. African Review of Money, Finance and Banking, Supplementary issue of“Savings and Development” 2000.pp.5-25. Milan, Italy. Alejandro D. (2010): Bautista conference foreign direct investment Mexico, United States, Canada NAFTA, Presentation Transcript. Agada, G. O and Okpe T.J (2002) Determination of risks of foreign investment. Journal of Economic and Social Research Vol I1 No2.Abaci Publishers.